You have no doubt heard of the trials and tribulations of the City of Detroit: the near death of the auto industry, massive population loss, infrastructure woes and high crime rates. The negative connotations have led to a public image of a city abandoned and in upheaval whereas the best-case-scenario associations portray it as a playground of urban decay and rock-bottom housing prices. When I learned that the National Main Street Conference was being held in Detroit this year, I was pleased that I would be able to see it for myself, albeit in the cocoon of a programmed conference setting. Having now been there I can make a few comments. First, it is a stunning city. There are architectural marvels (both in use and abandoned), striking parks and trail networks and an eclectic mix of things to do. Second, the city is hard at work. Travelling in and around the downtown core, there is evidence of a community working to rebuild and repair. Third, the city seems to be acutely aware of the volunteerism and resources required to improve its image. Bike patrols and on-foot clean-up crews strive to ensure the downtown core is safe and clean. Residents are cheerful and exceptionally welcoming. This said, did I really see Detroit? Visiting as part of a conference I no doubt had a curated experience of the city and limited time for exploration. It is important to remember that there are layers that we do not understand: a history of labour and race disputes, urban renewal programs and community activism. There is a long-standing population who is probably growing weary from being under the microscope. I would encourage everyone to visit and appreciate the people, public spaces and community spirit, along with the many restaurants, sports events, markets, museums, and music that make up Detroit. However, visit with an appreciation of the modern urban realities facing the city. Acknowledge and be aware of the complex layers of economic, social and political issues (past and present) that continue to inform the fabric of the city. 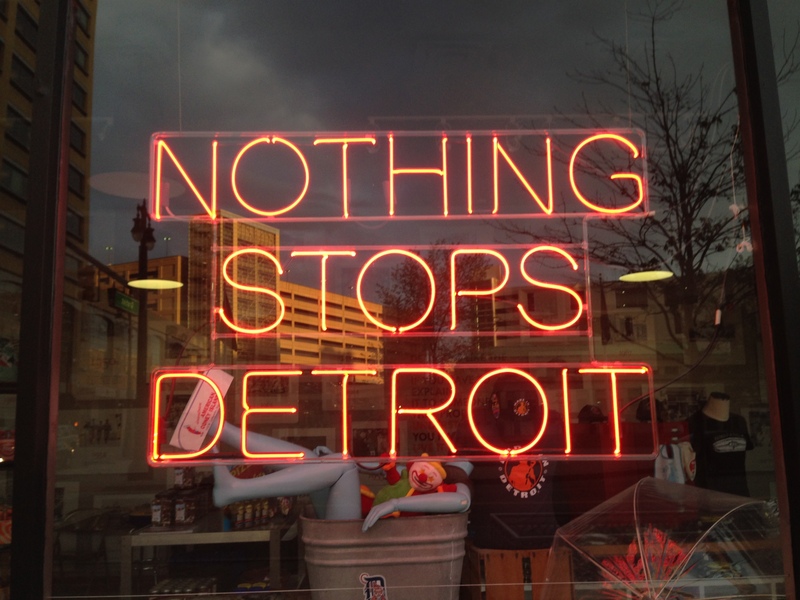 Detroit is a fascinating and many-faceted city and I would encourage you to make the trip. Stay tuned for upcoming posts about the content of the National Main Streets Conference! 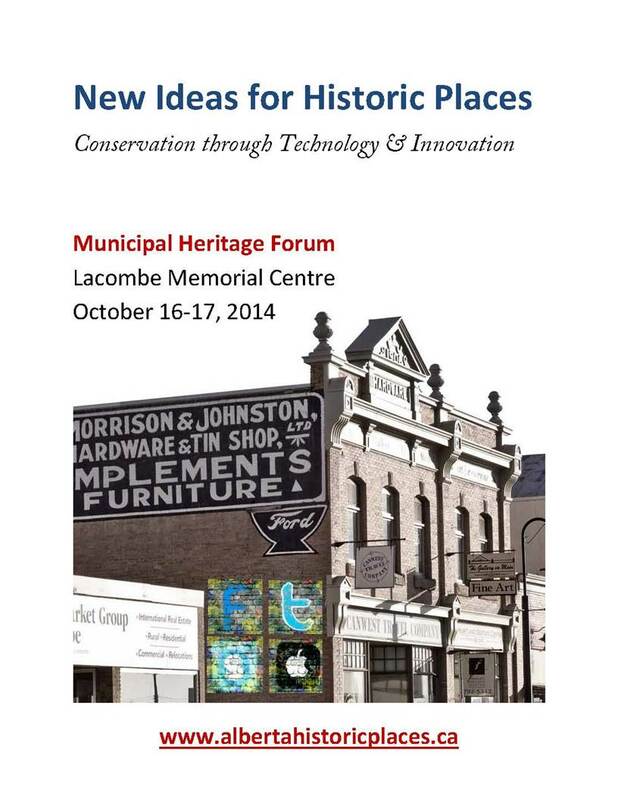 As previously announced, the 2014 Municipal Heritage Forum will be held on October 16th and 17th at the Lacombe Memorial Centre with sessions to be held in and around their award winning Main Street. The theme of this year’s forum is “New Ideas for Historic Places: Conservation through Technology and Innovation”. We are planning some exciting sessions to get you thinking about social media, mapping and documentation as well as workshops on using technology for building conservation. We hope to see you there! Registration will open and keynote speakers will be announced in June. For those of you who have attended past Forum’s you will be familiar with the Municipal Show and Tell sessions. Show and Tell is an opportunity for municipalities and volunteer groups to present projects they have been working on to their peers. It is a great way to learn about different heritage initiatives and to make valuable contacts for the future. The challenge we always have organizing Municipal Show and Tell is that you heritage conservationists are a humble group – many of you don’t realize how interesting your projects are and how much others can learn from you. Year after year we get feedback telling us how valuable the Show and Tell is to participants so we strongly encourage you to send us your ideas or recommendations! Presentations are approximately 15 minutes long, with time for questions included. If you would like to forward an idea for the Municipal Show and Tell e-mail us at albertahistoricplaces@gov.ab.ca. Sexsmith Heritage Inventory Almost Complete! 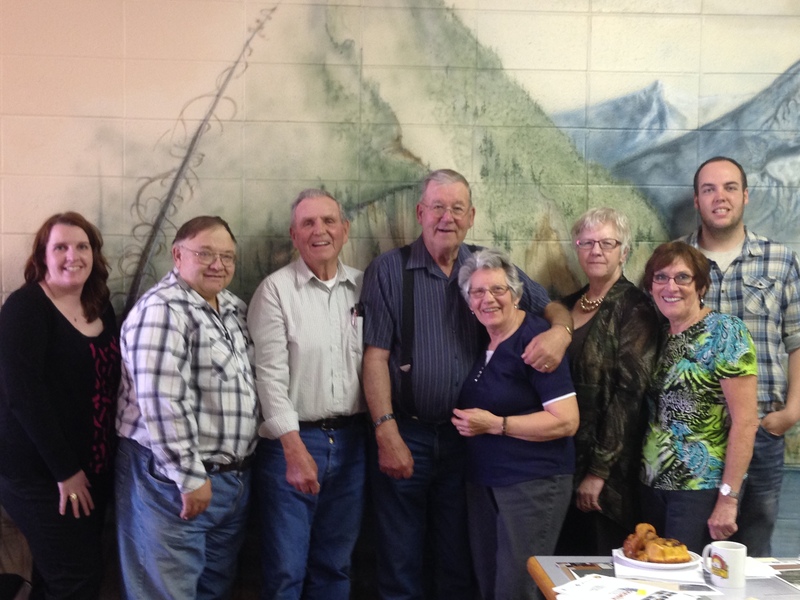 The Town of Sexsmith is now one step closer to completing their first Municipal Heritage Inventory. On April 30th the Town, in partnership with project consultant Donald Luxton and Associates Inc., held a public open house to present information on the Heritage Inventory project to the community. Approximately 14 residents attended the session to review possible themes related to the development of their community and to provide information on specific buildings. The following day the Town’s Heritage Advisory Board (HAB) met to review the proposed Statements of Significance for 16 potential locally-significant historic resources within Town boundaries. Their local knowledge of the people and events from Sexsmith’s past provided the project consultant with valuable information. Revisions will be made to the Statements of Significance and we anticipate the final report will be presented for review by Town Council by the end of summer. Originally known as Benville, Sexsmith was first settled in the early 1900s but experienced growth following the establishment of the ED&BC railway in 1916. The proximity of the community to the rail line caused expansion of agricultural production and established Sexsmith as a major hub for grain export. Sexsmith was once known as ‘The Grain Capital of the British Empire’ during the 1920s and 30s and at one time there were nine grain elevators situated adjacent to the railway. Today three remain and the Town is in the process of acquiring one for conservation purposes. 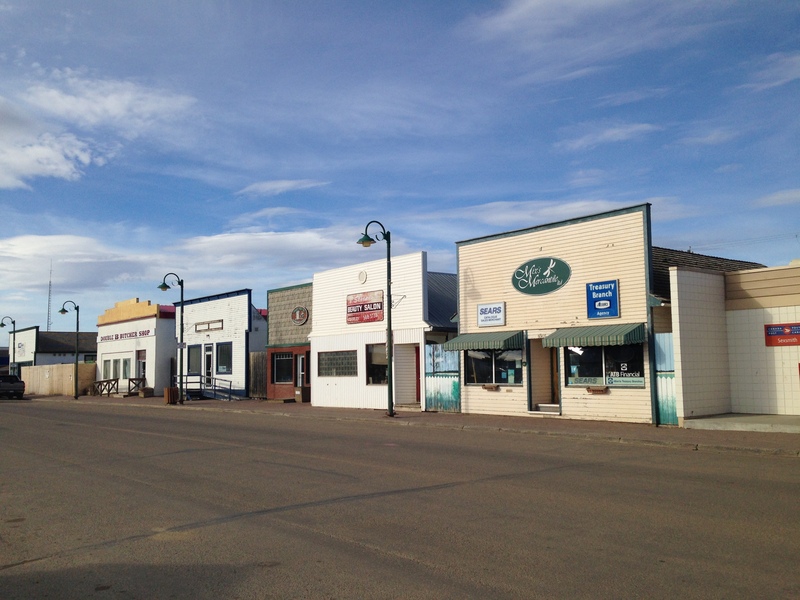 The community is further characterized by its relatively intact boomtown commercial main street, located directly opposite of the rail line and by the presence of two Provincial Historic Resources: the Northern Alberta Railway Station and the Sexsmith Blacksmith Shop. Heritage inventory projects are supported by the Municipal Heritage Partnership Program and provide municipalities with the process and tools to assess possible historic sites within their boundaries for future municipal historic resource designation. This post continues our look at the work of Alberta’s Archaeological Survey. An expanded version of this article can be found in the Fall 2013 issue of the Canadian Aviation Historical Society Journal. 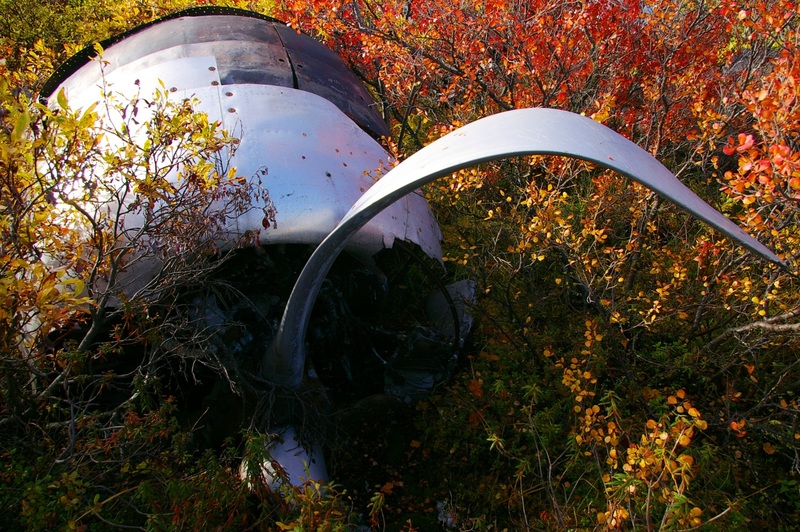 Plane wrecks are unique and dramatic physical records of human movement. We document here the archaeology and history of a 1952 B-17 plane crash to help illustrate the deep and fascinating roots of northern aviation. We reconstructed mission details from accident reports and discovered interesting connections to the famous Northwest Staging Route, which was a significant transportation network that spanned Alberta. 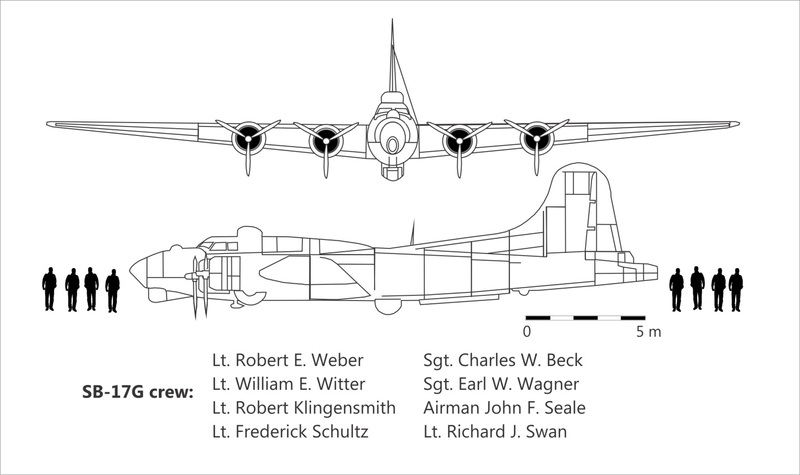 Scale of the SB-17G and the 8 crew members on the ill-fated 1952 flight (diagram T. Kristensen). On July 11, 1952, a modified B-17 (an SB-17G) set out from Alaska on a search mission in the Yukon to locate a crashed Royal Canadian Air Force plane that had disappeared in June. 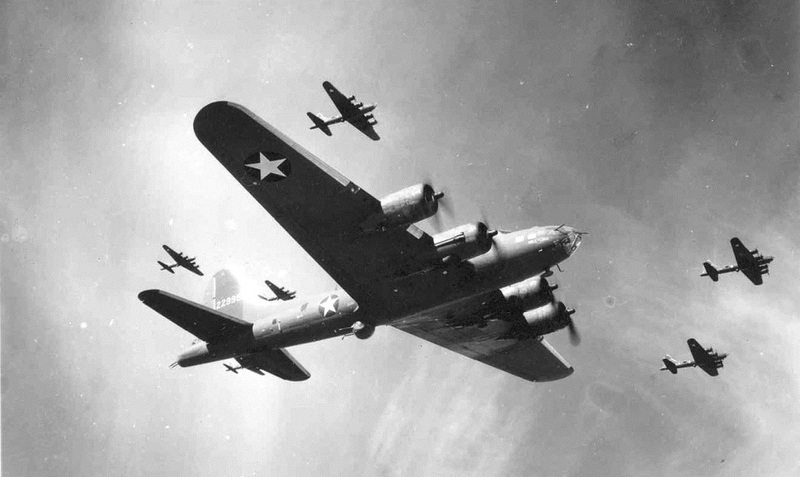 The B-17 was originally a Second World War era high altitude bomber, legendary for the damage it could endure in combat. Its durability, combined with the availability of surplus aircraft after the war, meant that B-17s were used for many post-war activities including weather survey, forest firefighting, and search and rescue. Mountainous terrain in which the SB-17G met its untimely fate (photo T. Kristensen). Eight crew members of the United States Air Force 10th Air Rescue Squadron were aboard the SB-17G as it entered a small mountain valley. The navigator was unfamiliar with local topography and 15 seconds into the valley, the crew began adjusting power in an attempt to avoid a fast approaching valley wall. 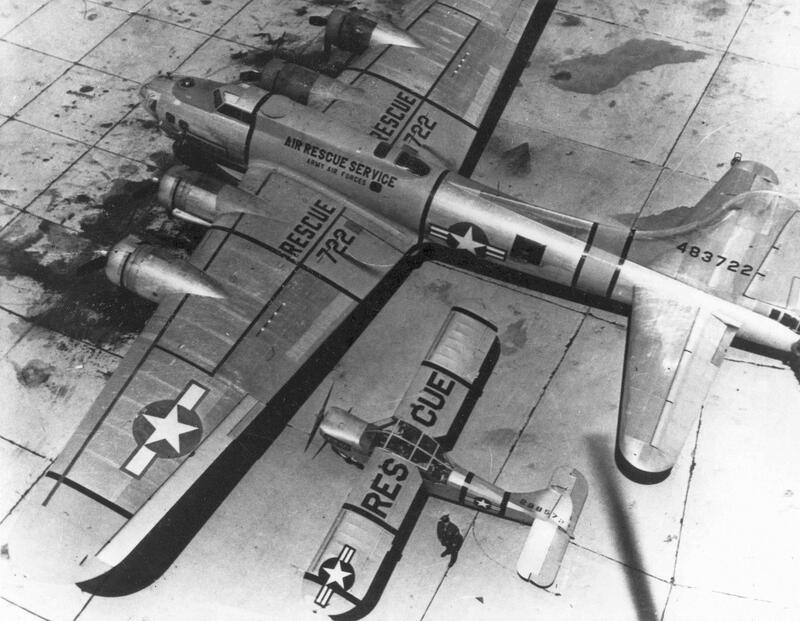 Because of its original purpose in high altitude flight, the SB-17G was not particularly maneuverable and couldn’t recover from its predicament. Stalling within meters of the ground, the left wing struck an alpine slope sending the aircraft into an arching skid path that tore through birch trees and bedrock cobbles for several hundred meters before coming to rest. The wreck was quickly consumed by flames. Five men evacuated immediately but the remaining three caught fire in their frantic attempts to depart. An heroic lieutenant escaped the wreck and pulled one man to safety while another emerged from the wreck engulfed in flames. Although he was immediately doused, the airman couldn’t recover from severe burns and died six hours later. The crew spent a somber night in the cold mountains before being rescued the next day. Northwest Staging Route in Canada and Alaska. Yukon Archives. Department of Defence Collection, 91/37 #51, PHO 419. The story of the SB-17G crash represents a small but significant piece of aviation history. Northern aviation assumed an international importance with the growth of the Northwest Staging Route in the 1930s. The Canadian portion began in Edmonton and linked a series of northern airstrips up to Alaska and Russia. Like Edmonton, most towns along the route were initially First Nations gathering spots that developed into fur trade posts when traders arrived. They eventually grew into agricultural, mining, forestry, or oil and gas centres. The Alaska Highway was built to connect these centres to help protect North America from a potential Pacific attack. 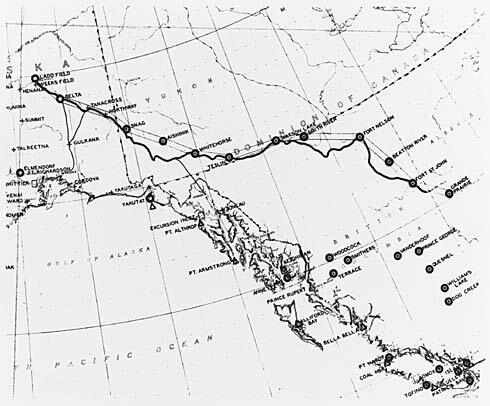 After the war, the Northwest Staging Route remained important for military exercises (which drew the SB-17G to the Yukon) and as a transportation route to other international conflicts. 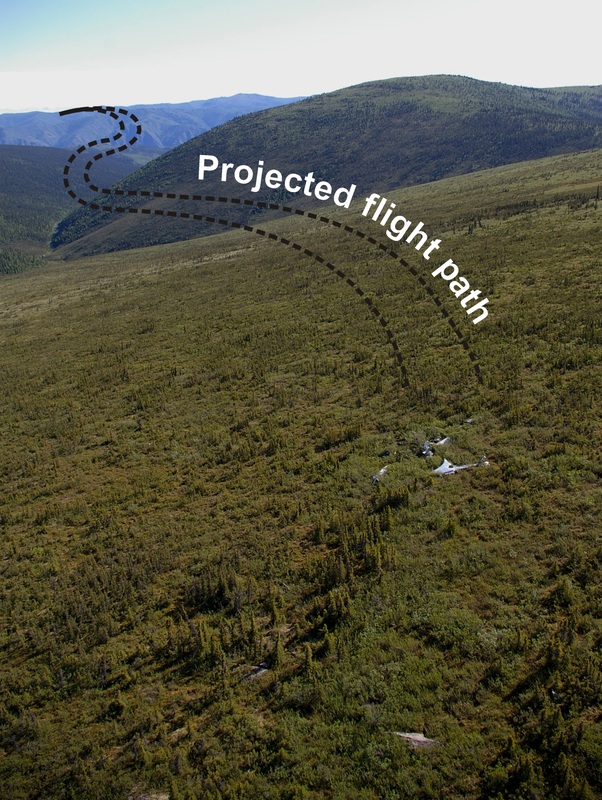 Reconstructed flight path of the SB-17G to its final resting spot (photo T. Kristensen). Given their experience on the land, First Nations people were hired as guides to help survey the Alaska Highway before construction. Consequently, much of the highway followed First Nations trails that existed for millennia. Other portions followed Gold Rush trails that started to criss-cross the north in the late 1800s. This synopsis illustrates how modern transportation systems in the north have deep histories. The interconnected travel network that now links northern towns has witnessed birchbark canoe paddlers, moccasins, Gold Rush wagons, tank treads, and jet streams. SB-17G (S/N 44-83722) used in the US Military Air Rescue Service (photo credit 060526-F-1234S-009.jpg, National Museum of the US Air Force). 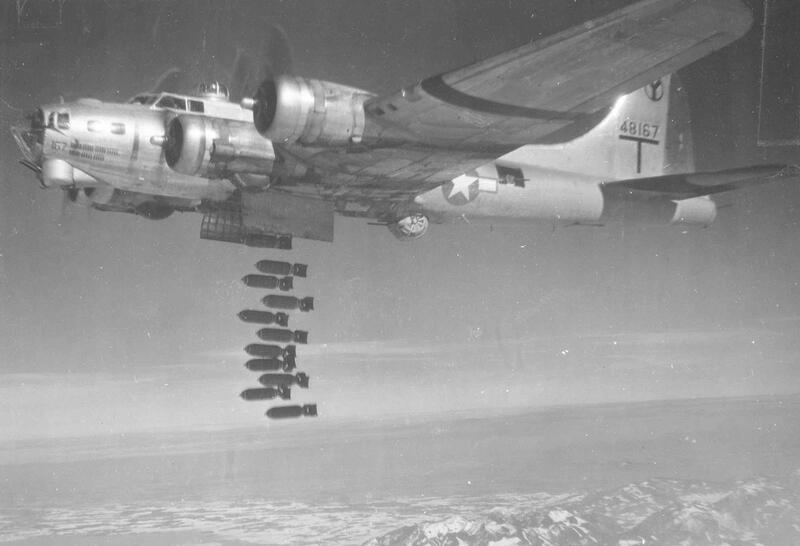 B-17G-50-VE (S/N 44-8167) during in-flight high altitude bomb drop in WWII (photo credit 050610-F-1234P-011.jpg, National Museum of the US Air Force). B-17F flying fortress formation in WWII (photo credit 050615-F-1234P-006.jpg, National Museum of the US Air Force). SB-17G propeller and engine (photo T. Kristensen). 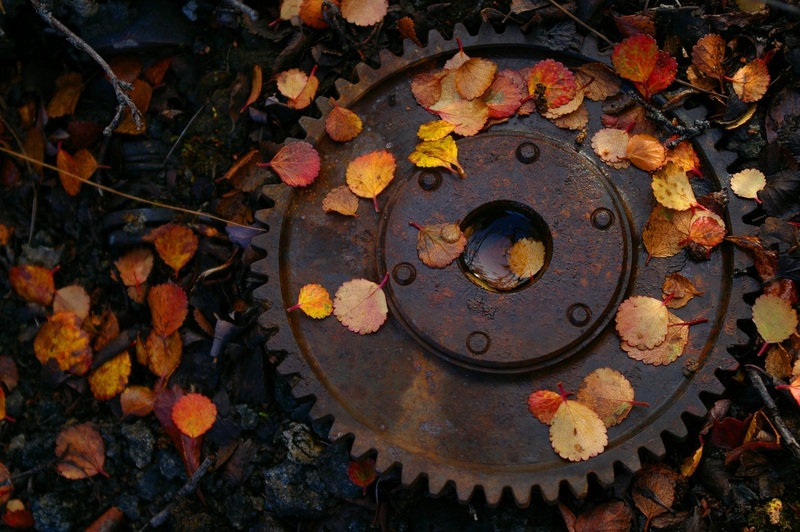 SB-17G gear wheel (photo T. Kristensen). 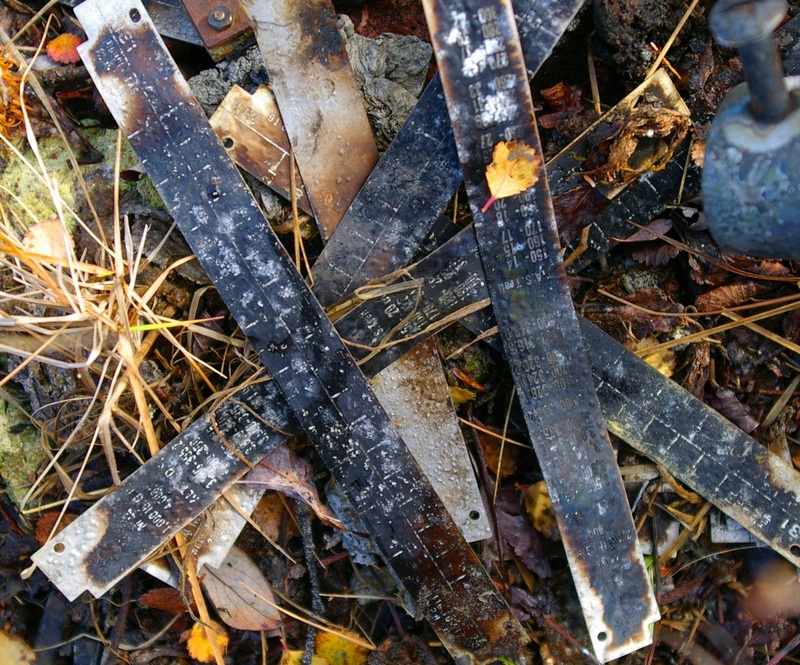 Charred measurement tags from SB-17G (photo T. Kristensen). 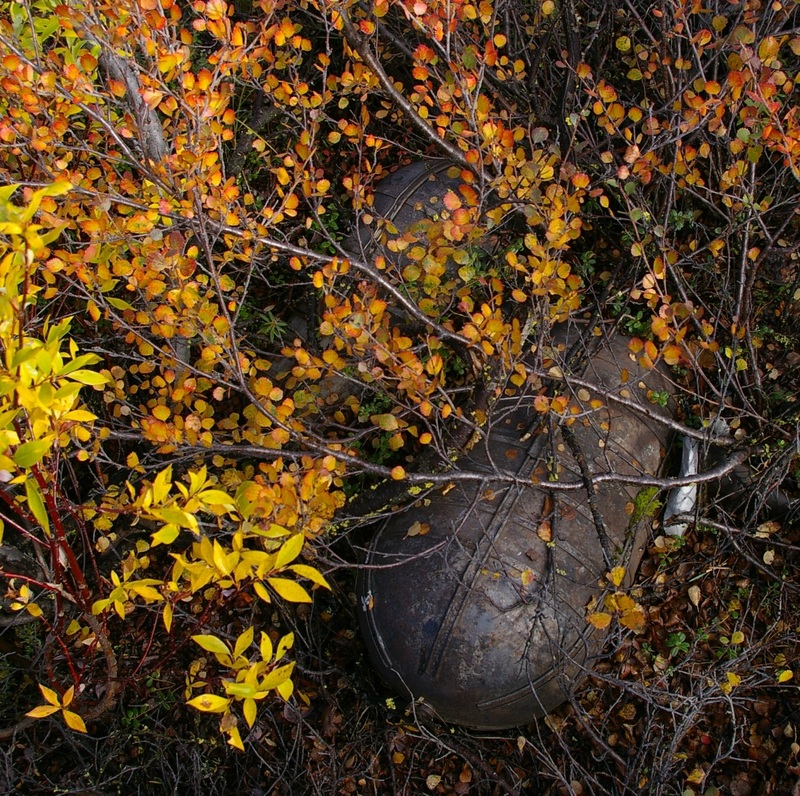 Canister from SB-17G (photo T. Kristensen). Wreckage of the SB-17G overlooking the valley it was unable to climb (photo T. Kristensen). 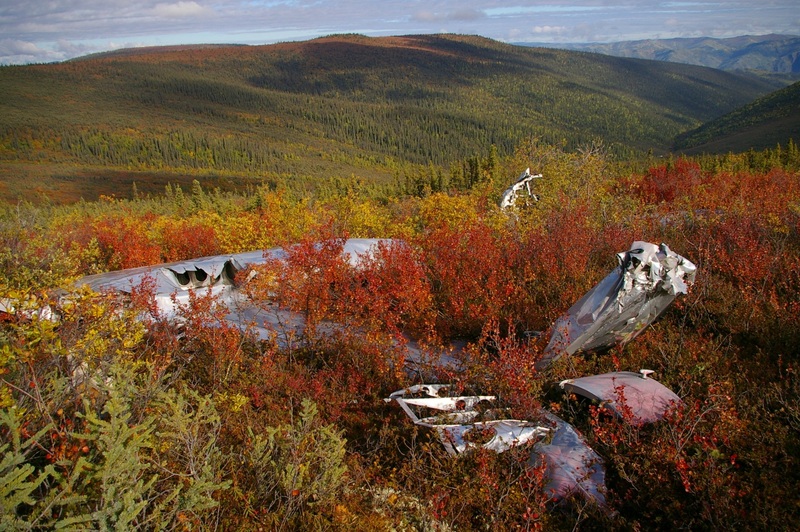 Territorial and provincial heritage legislation exists to preserve the remains of historic events like the SB-17G plane crash. A research permit is required to excavate any historic resource be it a 2 million year old fossil, a 2000 year old fishing camp, or a Second World War era aircraft. Historic objects are not permitted to leave the territories or provinces unless authorized by respective governments, which means artifacts can’t be re-located without permission. This legislation has created some conflicts in the past between heritage managers and people interested in salvaging plane wrecks but positive relationships and advance communication can help ensure that aviation historians and archaeologists work together to share their passion for the past. The story of the SB-17G crash highlights the military importance of the north and the historical depth of human movement. Written by: Todd Kristensen, Northern Archaeologist & Mike Donnelly, Archaeologist. Curling rinks, long low windowless buildings popped up in towns and hamlets, as each community grew. Inside were sheets of natural ice, 146 feet long and between 14 and 15 feet wide, marked out with lines and the target (called the house) for the rocks or stones as they are also known. Old curling rinks were cold places, but that was exactly the point—they had to be. In 1953 avid curlers in the small farming community of Conjuring Creek, south of Calmar, built a natural ice rink using straw bales for insulation. When someone unsuccessfully tried to buy the stack of bales, the rink became known thereafter as The Straw Pile! Albertans were already avid curlers by the late 1880s with clubs in Edmonton, Fort McLeod, Banff and the mining town of Anthracite. By 1902, Edmonton had a club with a three sheet indoor rink and 100 members. Vegreville curlers began on a pond in 1907; a year later they builit a three sheet indoor rink. 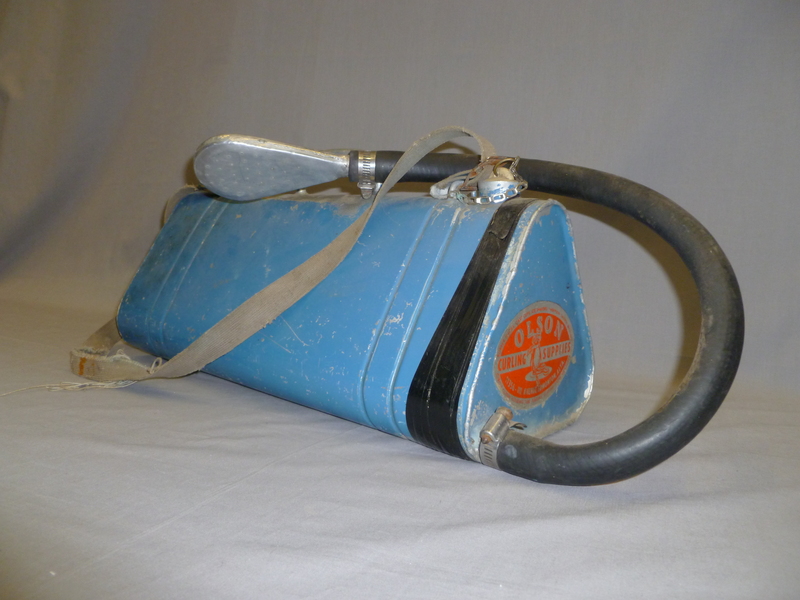 The introduction of mechanical ice plants to make artificial ice for curling rinks was a major change for the sport. Ice could be kept at the ideal temperature -5° (Celsius) to -3° with an ambient temperature of 4° at chest height. Artificial ice came to city centres first, although Claresholm, plagued by chinooks, installed an artificial ice plant in their rink in 1952. Vegreville opened a new professionally engineered and constructed a six-sheet artificial ice rink in 1955 at a cost of $80,000. Just as artificial ice was gaining momentum, the Conjuring Creek Curling Club was formed. Lumber was pricey, so Club members decided to build with straw bales, a tried and tested construction method for curling rinks. Square straw bales made thick walls which provided good insulation to control rink temperature. The bales were lined up, and spruce posts were spaced along their length to keep the bales together. The exterior walls were covered in wood slabs, and the rink was wired and lit by a generator. 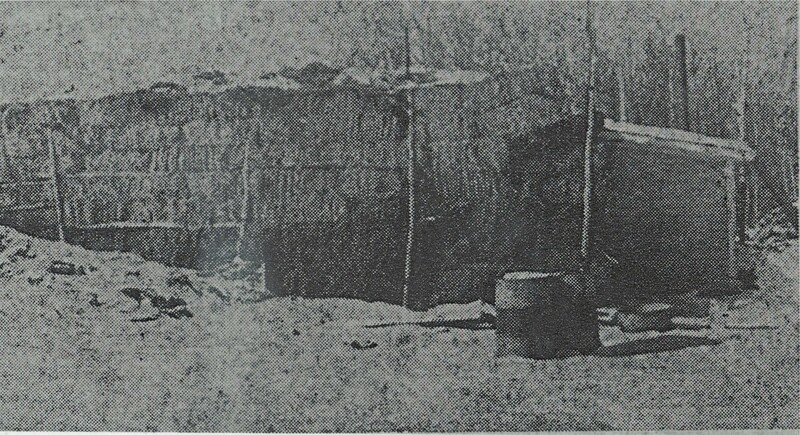 The first Straw Pile proved to be temporary, and in 1956 a new building was erected. Straw bales were used again, but this time the Club sprang for exterior siding and also lined the interior walls. The rink was bigger, with 2 sheets of ice. Further improvements in 1973 included fluorescent lighting and comfy red bench car seats in the viewing area. Preparing the ice took time. Sawdust was spread to the edges of the bale walls against the advice of B.E Olson, whose 1929 pamphlet The Art of Making True Curling Ice noted it was not a good conductor of cold and was inclined to go mouldy in spring. The rink was flooded in layers slowly and evenly; if it was too cold during flooding the ice would crack and peel off. At the right level the surface was planed with a homemade scraper, and then a scriber, a board with saw-teeth spaced to mark the rings of the house, was used to etch the ice. A hole made in the centre of the house to anchor a measuring stick for use during play. The water pumped from nearby Conjuring Creek was a little yellow so powered milk was added to whiten the ice, until it was decided to tank water in. The hacks for placing a player’s feet were frozen into the ice as the flooding progressed. The coloured lines and rings were painted on using paint mixed with oil and then frozen over, and finally the ice surface was pebbled. Closing the doors and turning off the lights in between games kept the rink cold. 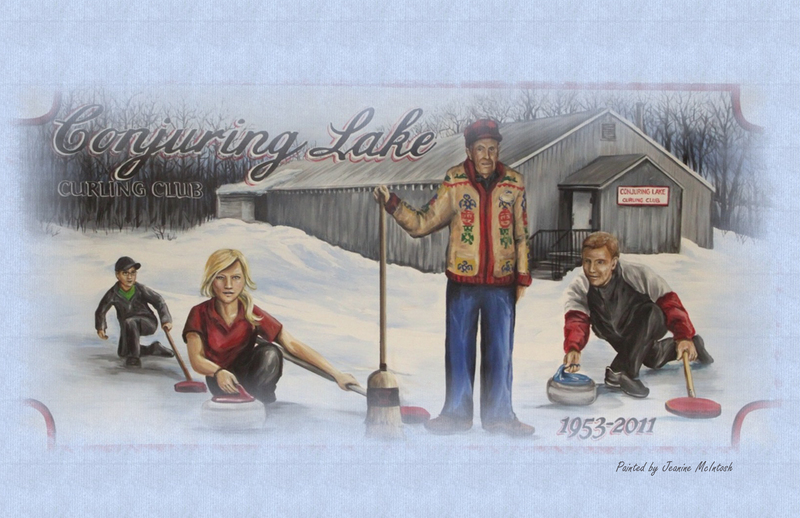 The Conjuring Lake curling rink was a community gathering place. Part of the fun was preparing the ice and the social aspect of curling included cheering from the viewing area, which eventually hosted 5 generations of eager spectators. The first prizes included jam, cigarettes, eggs and chocolate! Trophies came later. By 2010, however, it was no longer viable to keep the rink going and it was demolished, the straw pile burned in 2011. It’s not known how many natural ice rinks were built using straw bales in Alberta, but Conjuring Lake rink was probably the last one in use. We hope to be proved wrong—is there yet one more quintessentially prairie ice rink out there somewhere? 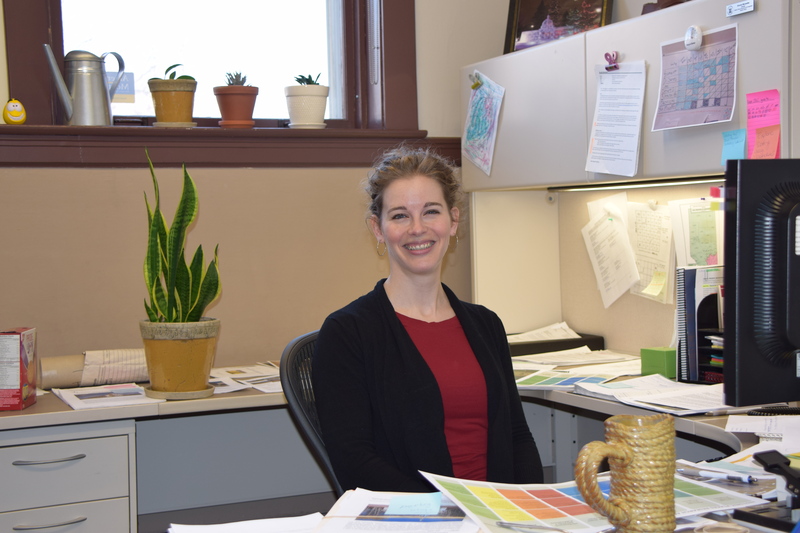 As Manager of the Historic Places Research and Designation Program, Brenda Manweiler heads what may be the unit with the greatest variety of responsibilities within the Historic Resources Management Branch. Brenda joined the branch as a Municipal Heritage Services Officer in 2009, after working for museums, British Columbia’s Heritage Branch, and Parks Canada. She has been in her current position since April 2013. Brenda Manweiler, pausing for a moment during a busy day. She now heads a six-member team of historians and heritage specialists. The unit’s primary role is administering the Provincial Historic Resources Designation Program (described below). But there’s much more! In addition, her group provides ongoing advice on how best to address the impact on historic structures (that are not designated) in cases where they may be affected by development in Alberta. This is part of an integrated regulatory function that Alberta Culture administers for the preservation of historic resources. Members of her staff provide research services to many of the historic sites operated by the Historic Sites and Museums Branch of Alberta Culture. Their services help, for example, to develop exhibits at these sites. 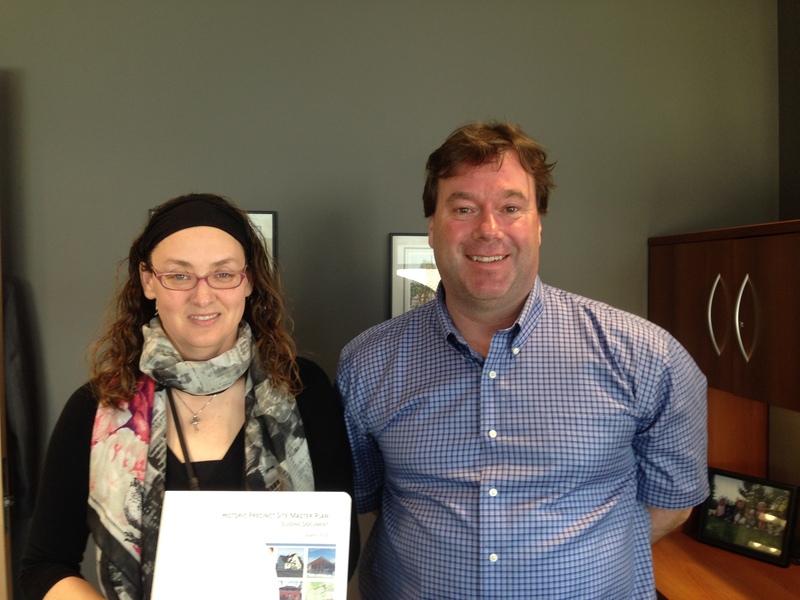 The Historic Places Research and Designation Program also works closely with the Alberta Historical Resources Foundation. The unit’s staff evaluates applications for Heritage Awareness, Research, and Publication grants submitted to the Foundation’s Heritage Preservation Partnership Program. As well, this unit is responsible for the Foundation’s Heritage Markers Program. This program supports the development of heritage markers that promote awareness of the historic people, places, events, and themes that have defined the character of the province. The markers are ideally sized for placement within parks, along trails or sidewalks, and in other community locales. Once the topic of a new marker has been selected, unit staff members develop the text, select photographs, and are responsible for coordinating the design, fabrication, and installation of the markers. What kind of historic places are “out there” in Alberta? The Coordinator of the Alberta Heritage Survey Program oversees a database of information about non-archaeological historic resources across the province. The Alberta Heritage Survey was established in the mid-1970s, has information dating back to 1971, and is being continually updated. Entries about individual resources include photographs, details of architectural characteristics, history, designation status, and location. This information comes from heritage surveys of neighbourhoods or building types, many of which have been commissioned by municipal governments and conducted by consultants and heritage groups. Today there are almost 100,000 individual resources documented on a searchable online database. How do Geographical Features Get Names? The Coordinator of the Geographical Names Program manages the process to formally name geographical features in Alberta. Names are chosen in accordance with international standards and guidelines, with preference usually given to names that have a demonstrated local and/or historical usage. The coordinator’s work includes communicating with governmental organizations from the municipal to international level, disseminating geographical names information from both popular and scholarly sources, maintaining records, and conducting related field and archival research. All this leads to making a recommendation on a name to the Alberta Historical Resources Foundation board and the Minister of Alberta Culture. How do places get designated? The Historic Places Research and Designation Program’s largest responsibility, however, is the Provincial Historic Resources Designation Program, which identifies, evaluates, and designates those historic resources that are most significant to the province as a whole. Resources eligible for consideration include structures, archaeological sites, palaeontological resources, and other works of humans or nature that are of value for their historic, cultural, natural, scientific, or aesthetic interest. 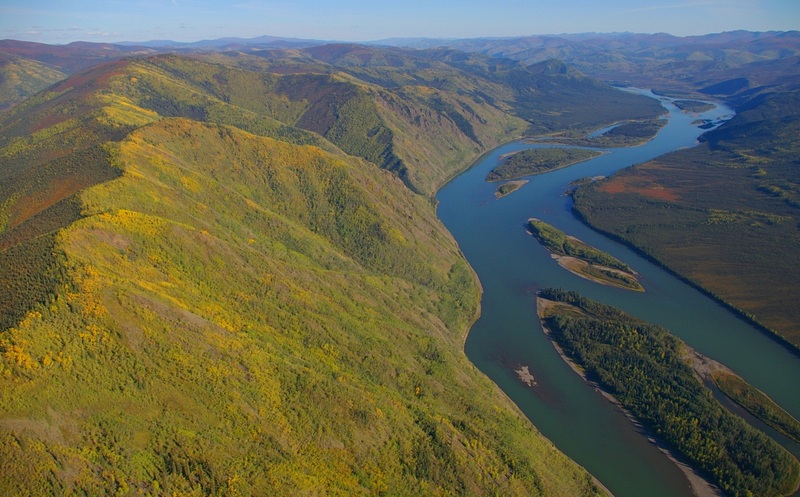 Once a resource is designated, its owner cannot destroy, disturb, alter, restore, or repair it without written approval from the provincial government. But the owner gains tangible benefits, including access to conservation grants and technical advice, and the intangible benefit of knowing that a valued property will be preserved and protected into the future. Currently there are some 360 sites protected as Provincial Historic Resources in Alberta. Owners or advocates interested in obtaining heritage designation for a property often start by contacting Brenda for advice. She’ll ask questions to determine if the property is eligible for consideration, and to gauge whether designation should be pursued at the provincial or municipal level, or both. Occasionally one of the branch’s Heritage Conservation Advisers will make a site visit to answer property owners’ questions and assess the potential eligibility of their property for designation. Once an application is received, Brenda administers the evaluation process. The Designation Committee, made up of her staff plus staff of the Heritage Conservation Advisory Services unit, meets about every six weeks to confirm the eligibility of new applications and to monitor the progress for sites currently under study. The Designation Committee works to determine if the site has heritage significance (according to five specific evaluation criteria), and a Heritage Conservation Adviser studies the site to determine if it retains enough integrity to communicate that significance. Much archival and onsite research is required to complete an in-depth evaluation. If the committee recommends designation and that is approved at a higher level, the owner is informed and his or her support is obtained, a designation order is signed, and the site is listed on the Alberta Register of Historic Places, an online database of all designated historic resources in Alberta. There have been about five new applications since Brenda started in her position nearly a year ago, so she estimates that five to ten per year would be the norm. Her team is currently working through the evaluation process for approximately twenty sites. 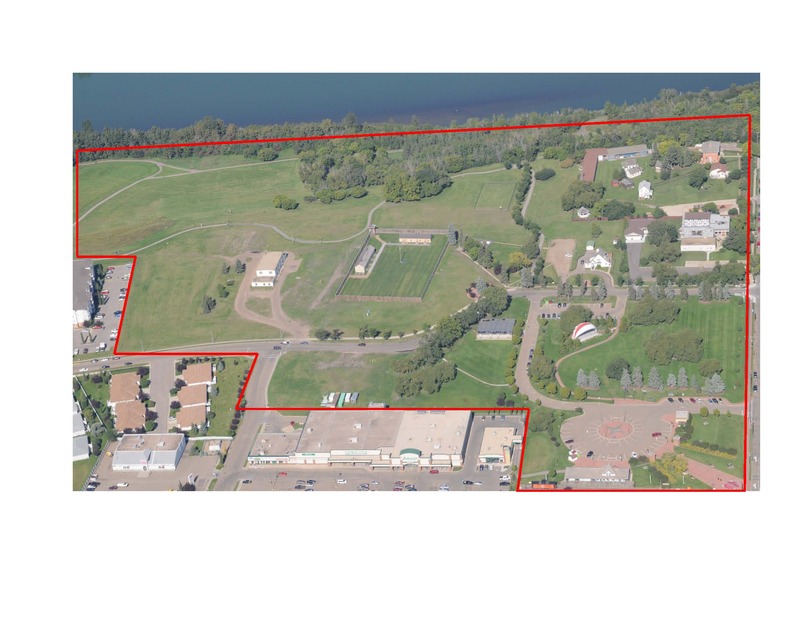 The City of Fort Saskatchewan is one step closer to realizing their vision for the development and interpretation of a significant community amenity through Council’s recent approval of the Historic Precinct Site Master Plan Guiding Document. Located adjacent to the City’s downtown and along the edge of the North Saskatchewan River, the Historic Precinct provides a unique opportunity to showcase the cultural history of Fort Saskatchewan and to develop a space for public learning and enjoyment. “An important part of the Precinct’s heritage value is found in the relics of law and order and public works, including buildings, structures, sightlines, earth mounds, plant materials and features that remain in situ. These relics constitute part of the heritage value of the area by providing tangible evidence of how it was transformed and used by the NWMP, Canadian Northern Railway, the Province and the City.” (Historic Precinct Site Master Plan, page 9). The planning process sought to integrate local values into the final plan and therefore included public and stakeholder consultation through surveys, open houses and workshop sessions. 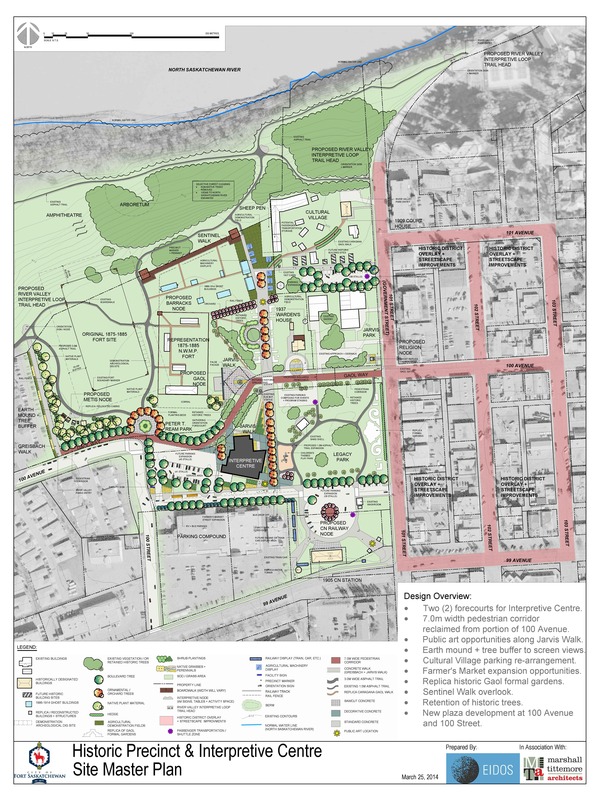 The Master Plan involved considering the long-term development and interpretation of the historic precinct, including integration of existing Provincial Historic Resources, recommendations for pedestrian circulation and way-finding, interpretation opportunities and development of a conceptual design for a new Interpretive Centre. A detailed phasing plan was also provided to allow the City to structure implementation in a coordinated and cost-effective manner. The uniqueness of the site is exemplified by the existence of three Provincial Historic Resources within its boundaries including the North West Mounted Police Post, the Fort Saskatchewan Museum (Courthouse), and the Canadian Northern Railway Station. These three historic resources are proposed to be key elements in the interpretation and programming of the Historic Precinct and are considered as Historic Precinct Nodes in the Master Plan. Original 1875 Fort Site Node – This Provincial Historic Resource is presently an open native grass field and will remain untouched during development, with the long term goal of undertaking small scale research and public archaeology programs in partnership with interested academic institutions, archaeological societies and the Province of Alberta. Fort Saskatchewan Museum and Cultural Village Node – The Fort Saskatchewan Museum (Courthouse) is a designated Provincial Historic Resource. The Master Plan calls for the land surrounding the Courthouse to be utilized as a ‘cultural village’ in which historic buildings and artifacts will be displayed. Railway Node – The CNR Station will continue to be space for use by community groups. The area around the Station will be enhanced to include an opportunity to showcase other rail infrastructure, landscaping and opportunity to enhance access to the adjacent Legacy Park and farmer’s market plaza. Other Historic Precinct Nodes proposed within the plan include a Gaol Node, Religion Node, MétisNode and First Nations Node. The City will continue with planning the programming for the future Interpretive Centre with hopes of breaking ground by the end of 2014. Conservation Plans have been prepared for the Courthouse/Museum and CNR Railway Station to ensure that on-going improvements and maintenance are consistent with accepted conservation practices. In accordance with the terms of designation, approvals will be obtained for any projects within the site that will affect the Provincial Historic Resources as well as work in the vicinity of the NWMP Police Post due to the high archaeological potential of the site. The Historic Precinct Master Plan was partially funded by the Alberta Historical Resources Foundation under the Heritage Management Plan grant category of the Municipal Heritage Partnership Program. Though Heritage Management Plans typically take the form of a document that outlines policy and a process for municipal designation, the grant category is flexible and can apply to projects that involve planning and policy development for the stewardship of historic resources more broadly. The Historic Precinct Site Master Plan is an example of how the program can be tailored to meet the unique needs of municipalities.